A post on Wisconsin's Cheese Underground blog on Sunday, June 8, began with these alarming words: "A sense of disbelief and distress is quickly rippling through the U.S. artisan cheese community." The Food and Drug Administration (FDA), the post continued, had recently forbidden aging cheese on wooden boards — a rule that, if enacted, could wreak havoc on cheese makers' ancient craft. The press ran with the story, declaring end times for artisanal cheese in America. A no-wood rule could force cheese makers to destroy aging inventory, and the cost of replacing wood shelving with other materials (such as stainless steel) could financially ruin some artisans. At Jasper Hill Farm in Greensboro, secondary sources reported that the measure could cost $20 million. Seven Days could not independently verify that number, as farm representatives refused repeated requests for comment. In fact, of the 29 Vermont cheese makers contacted for this story, not one who uses wood agreed to speak on the record by press time. The few who were willing to talk said they didn't age cheese on wooden boards and would be unaffected by the policy. According to Vermont Cheese Council (VCC) executive director Tom Bivins, local cheese makers jointly decided to keep a low profile until more information became available. "I think people wanted to wait until they had something to actually say," Bivins said, citing inconclusive early reports. "There was no information about whether [the FDA was] going to do this, or implement it immediately ... People were concerned about how this was going to play out." In an industry where the final product takes months — sometimes years — to mature, the FDA's apparent new stance was a sudden and unwelcome surprise, Bivins said, noting, "It caught people off guard and was very disconcerting for everyone." As one off-the-record cheese maker put it in an email, "We're feeling a bit cautious about the pace and scope of this recent development and would prefer to defer [comment] to organizations like the Vermont Cheese Council and ... the American Cheese Society [ACS]." On Tuesday, June 10, the Denver-based ACS issued a position statement urging the FDA to "[r]evise its interpretation of the [code ... and] to continue to permit properly maintained, cleaned and sanitized wood as an aging surface in cheese making as has been, and is currently, enforced by state and federal regulators and inspectors." The ACS also extolled the virtues of safe cheese making and outlined a set of best practices and safety considerations for aging on wood. With the implementation of the 2011 Food Safety Modernization Act (FSMA) looming, makers of food who rely on age-old wisdom and practice are on edge. The act will rework federal food safety standards with a focus on preventing — rather than handling cases of — food contamination. Production rules are about to be rewritten. Producers have no idea what changes are on the horizon. In off-the-record conversations, members of Vermont's artisan cheese community wondered if the FDA's apparent new protocol was one of those changes. Under the law, new regulations will be publicly reviewed and commented on, but this week, cheese makers seemed to fear that the FDA was engaging in top-down rule making sans consultation with them on matters concerning their livelihood. Hoping to fly under the radar, they kept mum to the press and quietly called their congressmen. Before long, lawmakers jumped into the fray. Right now, the House is hammering out next year's funding for the Department of Agriculture, and with it, the FDA. Via phone last Tuesday evening, Vermont Rep. Peter Welch said he will move to amend the ag funding bill to preclude the FDA from using federal funds to keep wood out of cheese making. Welch's amendment reads: "SEC. ll. None of the funds made available by this Act may be used to establish, implement, or enforce any prohibition against aging or ripening cheese on wood under section 110.40 of title 21, Code of Federal Regulations." The congressman, citing broad bipartisan support, said he is confident the amendment will pass. If it does, it should quash the issue for good. But was there ever really a risk that the FDA would ban wooden cheese-aging boards? Or was it simply one bureaucrat's comment taken out of context? On Tuesday, Welch, who is up for reelection this fall, acknowledged that it was a good question, but said he wasn't willing to take any risks. "We've got to stop this in its tracks," he said. "The cheese makers are rightly alarmed, and the FDA has issued a statement that ... creates more ambiguity and uncertainty. There's just no reason to ban, or suggest the possibility of banning, wood boards on which to age cheese." In addition to noting local cheese makers' woes, Welch expressed concern that the measure could touch off the "mother of all trade wars with Europe" if the FDA banned European cheeses aged on wooden boards. 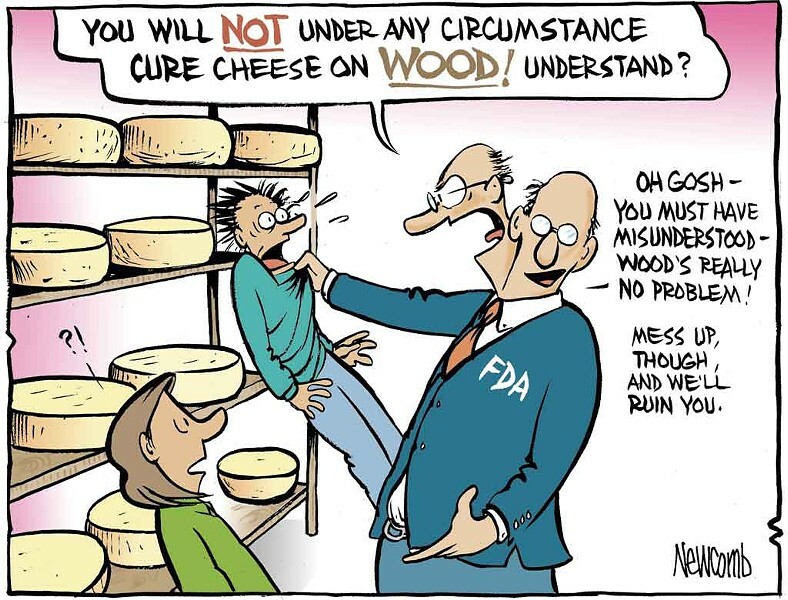 By 5 p.m. that same Tuesday, the FDA issued a "clarification": "[The] FDA is always open to evidence that shows that wood can be safely used for specific purposes, such as aging cheese ... The FDA will engage with the artisanal cheese-making community to determine whether certain types of cheeses can safely be made by aging them on wooden shelving." Three hours later, a Vermont cheese maker emailed Seven Days, describing the issue in seemingly dismissive terms. "Looks like the story may have passed you by," he wrote, citing the FDA statement. "This isn't the end of the saga, but the rhetoric is significantly less antagonistic." But when we asked the cheese maker to anonymously contribute an image from his company's Facebook page, he replied, "We'd prefer not to draw attention to ourselves ... We don't want a target on our backs from the FDA. Even if they are sounding less antagonistic, FSMA gives them great power to shut down food producers." Twenty-four hours later, on Wednesday, June 11, the FDA issued a "constituent update" on its website with a conciliatory tone: "At issue is a January 2014 communication ... which was sent in response to questions from New York State. The FDA recognizes that this communication has prompted concerns in the artisanal cheese making community. The communication was not intended as an official policy statement, but was provided as background information on the use of wooden shelving for aging cheeses and as an analysis of related scientific publications. Further, we recognize that the language used in this communication may have appeared more definitive than it should have, in light of the agency's actual practices on this issue." The statement also said that past enforcement actions at facilities using wooden shelving were related to pathogens. "Since 2010, FDA inspections have found Listeria monocytogenes in more than 20 percent of inspections of artisanal cheesemakers," it read. No data link said bacteria to wooden shelving, the statement continued, and "the FDA will engage with the artisanal cheesemaking community" to learn more about current practices, review data and discuss the safety of aging on wood. "We welcome this open dialogue," the statement concluded. Despite this apparent backtracking by the FDA, on Thursday, June 12, Vermont cheese makers responded to more than 15 additional calls for comment with radio silence or tepid, off-the-record remarks. "I think the FDA thing is over," one cheese maker from Chittenden County said, suggesting Seven Days call another local farm for comment. "I think it ended and it's not happening." At the VCC, Bivins embraced the manifest peace. "We'll be interested in speaking to the FDA and working with them instead of [being] at odds with each other," he said. But Rep. Welch still saw cause for concern, citing agency correspondence from earlier this year. "Unfortunately, this 'clarification' directly contradicts a clear statement of [the] FDA's position sent to my office on March 27," he wrote via email on June 12. Provided for reference, that statement condemns the use of wooden boards, in line with the January 2014 comments that ignited the drama in the first place. Using wooden shelves, it reads, "does not conform to current Good Manufacturing Practice (GMP) regulations, which require that 'all plant equipment and utensils ... be so designed and of such material and workmanship as to be adequately cleanable, and shall be properly maintained.' ... The porous structure of wood enables it to absorb and retain bacteria, therefore bacteria ... colonize not only the surface but also the inside layers of wood." The statement cites "recent academic studies" showing that Listeria monocytogenes can survive on clean, sanitized wooden aging boards. On Thursday evening, Sen. Patrick Leahy, responding to a request for comment, acknowledged that the cheese community was still vulnerable. "While the FDA's recent clarifications have eased some fears," his office wrote in an email, "for Vermont's cheese makers the FDA's statements have done little to address concerns that this centuries-old practice is at risk of coming under attack, as are their livelihoods, if the FDA continues this overreach." Welch noted that the government needs to express itself with unequivocal clarity on an issue muddied by a week of sensationalism, clarifications on clarifications, backtracks, retractions and apologies. "It appears the FDA's right hand doesn't know what its left hand is doing," he wrote in an email. "Which FDA should cheese makers listen to?" At press time, the House ag appropriations bill, and Welch's amendment with it, remained pending in Congress, up for debate this week.